Drawing inspiration from mid-century styling and simplicity, Danby's patented Contemporary Classic collection of refrigerators reimagine retro for the modern consumer. Featuring Danby's exclusive retro-inspired curved door design, black metallic door and chassis finish, rubber-grip ergonomic chrome handle and stylized chrome worktop, its exterior features are only outmatched by its signature black interior. Boasting 11 cubic-ft (311 litres) of storage and cooling space, it features three chrome-trimmed tempered glass shelves and five integrated door shelves for maximum storage versatility. There's more than enough room for larger bottles and the spacious unit helps keep electricity bills in check with its ENERGY STAR rating and state-of-the-art mechanical thermostat. Maintenance and cleaning are as simple as can be with the automatic defrost system. It also includes an efficient and reliable interior white LED light. Drawing inspiration from mid-century styling and simplicity, Danby's patented Contemporary Classic collection of refrigerators reimagine retro for the modern consumer. Featuring Danby's exclusive retro-inspired curved door design, red metallic door and chassis finish, rubber-grip ergonomic chrome handle and stylized chrome worktop, its exterior features are only outmatched by its signature black interior. Boasting 11 cubic-ft (311 liters) of storage and cooling space, it features three chrome-trimmed tempered glass shelves and five integrated door shelves for maximum storage versatility. There's more than enough room for larger bottles and the spacious unit helps keep electricity bills in check with its Energy Star rating and state-of-the-art mechanical thermostat. Maintenance and cleaning are as simple as can be with the automatic defrost system. It also includes an efficient and reliable interior white LED light. Designer 3.2 cu. ft. Compact Fridge in White - ENERGY STAR® Ideal for lunchrooms, small kitchens, wet bars and dorm rooms, this compact refrigerator from Danby can be adjusted to the same height as your rooms countertop. It comes with a full-width freezer section for frozen foods, easy-to-use temperature controls and the patented CanStor<sup></sup> beverage dispenser system. Best part? You won't need to worry about anymore sky-high electricity bills - this mini fridge also boasts an ENERGY STAR rating. Designer 3.2 cu. ft. 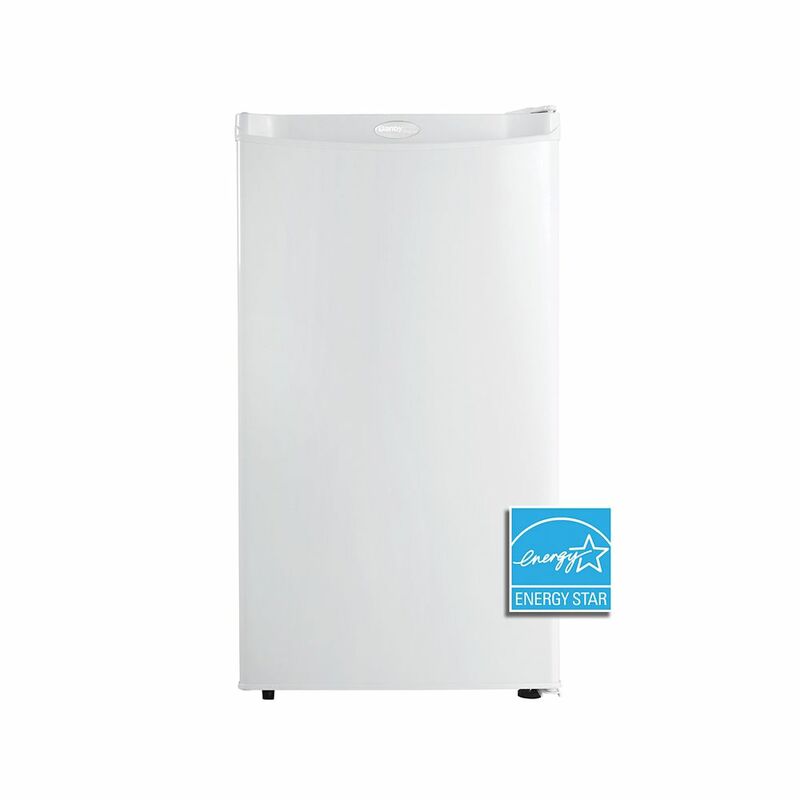 Compact Fridge in White - ENERGY STAR® is rated 4.6 out of 5 by 5. Rated 4 out of 5 by Tony from Great product, disappointing completion The new fridge arrived on schedule, in perfect condition, and exceptionally well packed with obvious thought as to ease of unpacking. The quality of manufacture appears to be good and performance is fully satisfactory. Rated 5 out of 5 by Natalie from Lots of Interior Space Bought this for our small office. Lots of interior space and the can storage in the door has been innovated so that you can use it for things other than cans (many other models make it so that you can only puts cans - wasted space!). Decently quiet. Rated 5 out of 5 by rogerbob from Pleased with this product Fits perfectly to replace old fridge and has perfect storage spaces. Rated 5 out of 5 by themactep from Good small fridge We bought this fridge to keep beverages cool and handy on the upper level of our house. The fridge is quite and does the job. Nothing to complain about. The price is right. Overall, we're happy with the purchase. Is this fridge csa certified? Hello Bandita, all of our units are UL and CSA certified. What is the difference between assembled height and item height? the space this fridge needs to go is 33&quot; from floor to under the counter so i want to make sure it is going to fit. Hello Jholmes, the assembled height includes the legs.